Rabbi Schlesinger visited Chicago in 2015 with Ali Abu Awwad, one of his Palestinian colleagues, who has one of the most viewed presentations on Ted Talks about the power of non-violent resistance in the cause of righting relations between peoples in conflict. They met with Chicago rabbis and Christian leaders, leaving many of us deeply impressed with how they are working from the ground up to overcome suspicion and hostility with 'Face 2 Face' relations, mutual understanding, and partnership for greater justice and peace in the region. If you are able to visit Roots' community on the West Bank, it would add a very important dimension to your knowledge of the region and what Palestinians and Israelis who are neighbors are doing in partnership that one rarely hears about in US media outlets. As the date of Hanan and Ali’s visit grew closer, the buzz within the synagogue palpably increased. Although no one knew precisely what to expect as a rabbi from Alon Shvut and a Palestinian from a village near Hevron were to take the stage together, people were making their plans to attend. When the appointed hour on Shabbat afternoon arrived, we were already adding chairs to the room, as the attendance was clearly exceeding what we had anticipated. Hanan and Ali each spoke with passion and compassion, fully recognizing the hard realities yet not flinching from hope. Their mutual commitment to understanding the other, and to accepting the truth of the other’s sacred connection to the land, was mind-blowing and transformative for the audience. When the time for the Afternoon Prayers arrived, I was able to induce people to go upstairs to the sanctuary only by promising them that the question and answer period would continue afterwards. And it did. And it was a magnificent afternoon of thinking, learning, and hoping. I encourage you in the strongest terms to invite Hanan and Ali to share their stories and perspectives with your congregation as well. Everyone who loves Israel and seeks her welfare will be intrigued and moved by what they see and hear. Not because Hanan or Ali has offered a concrete “answer”, but because their hearts are open and determined to work on one. 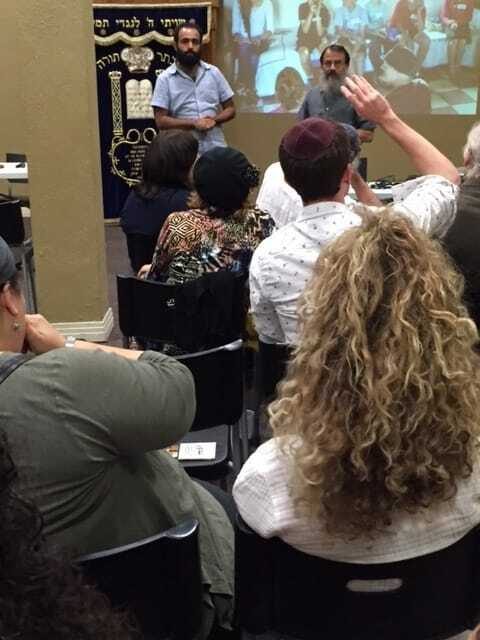 Our synagogue which is Orthodox was able to co-host a lunchtime presentation (at our neighborhood kosher BBQ restaurant) this afternoon featuring Rav Hanan Schlesinger and his Palestinian co-director Ali Abu Awaad as part of their American tour for their organization Roots/Shorashim/Judur. It was an outstanding - truly amazing - presentation. A Palestinian patriot and a resident of Gush Etzion devoted to the mitzvah (religious commandment) of Yishuv Eretz Yisrael (settling the Land of Israel) were able to captivate a politically diverse audience (that included some liberals as well as the most politically right-wing members of my shul). I'm determined to try to find a way to bring them back to our congregation on a Shabbat when they are next in the United States so that more of my community can be exposed to their message. Needless to say, they typically speak to non-Orthodox Jewish audiences. Even as an educator, it is uncommon for my own prejudices and preconceived notions to be challenged so dramatically by new perspectives. And even as a so-called religious leader, it is uncommon for me to see such profound evidence of the hand of God, opening hearts and conquering hatred and fear. You are one of the best communicators I have ever encountered - and I work in the world of the UN, Washington DC diplomats and religious leaders. You told your story with such humility, vulnerability and humor that you disarmed all of us. And we’ve been raising the points you made to us with our speakers in Bethlehem. I think you are doing extremely important work and your voice is essential for the future. So Hanan let me say first that you were spectacular. We were all stunned by the power, the inspiration, and the “spiritual grandeur” (Heschel’s term) of your words and deeds.